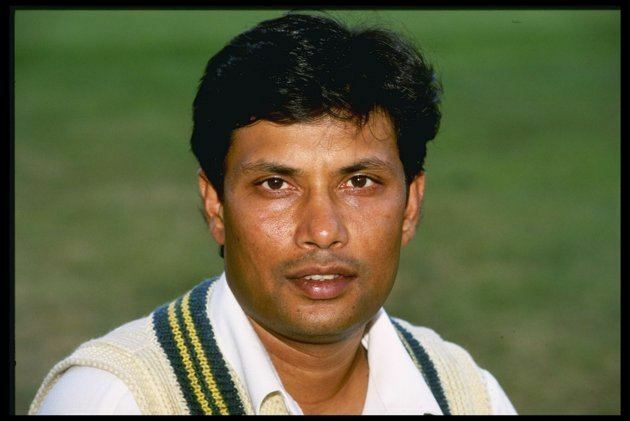 Mohammad Asif Mujtaba (Urdu: آصف مجتبیٰ, born 4 November 1967 in Karachi, Sindh) is a former Pakistani cricketer who played in 25 Tests and 66 ODIs from 1986 to 1997. During the, 1994-95 period he briefly served as the deputy to Saleem Malik in the Pak national team. He is best known for hitting a Steve Waugh full toss on the last ball in an ODI at Hobart in 1992-93 for six, when Pakistan needed 7 runs to win, thereby tying the match. He also enjoys the remarkable batting average of 214.00 from his 6 ODIs against Australia. After retiring, Asif went to the US and began helping other children at cricket at the Dallas Youth Cricket League. He is currently lives in Plano, Texas. In March 1987, he led the Pak (U-25) side to a successful tour of Zimbabwe. A decade later, the Pakistan 'A' team won the 3rd SAARC Quadrangular Trophy in Dhaka, under his captaincy. Like all true leaders, he led from the front, scoring 67 against Bangladesh, in the first match of the Trophy, and finishing with 91 against India 'A' in the final. He was adjudeged the Player of the Final & the Player of the Tournament. In domestic cricket, he was highly successful, as captain of PIA. In Nov. 1986, Mujtaba was selected to make his Test debut against the mighty WI. With Saleem Malik injured, the selectors preferred Mujtaba, over more experienced Wasim Raja for the job. It was an unenviable job, as the WI pace battery was spearheaded by Malcolm Marshall, the fastest bowler at that time. Alongside him were Courtney Walsh and Tony Gray. Thus, the selectors showed great confidence by giving Mujtaba his debut. Unfortunately, young Mujtaba, barely 19, failed to justify the selectors confidence in him. His four innings in the series yielded a mere 32 runs, and after another failure against the English, a year later, he went into oblivion for five years. His ODI career started disastrously with two ducks against the Caribbeans. More of a worker of a ball, rather than a hitter, Mujtaba's batting was never really suitable for ODI cricket. A modest average of 26.04, over 66 matches testifies to this fact. However, he did score an ODI hundred. A string of strong batting performances in the domestic arena meant that he was recalled for the England tour during the summer of 1992. Again, the selectors showed their faith in him by putting him in the important No 3. position. The move was only partly successful. His first test fifty, 59 at Lords, helped Pakistan win the match by 2 wickets. He followed this with 57 & 40 in a high scoring affair at Old-Trafford. Also, he is known for his double hat-trick against India. In the Spring of 1993, he batted with great courage against the might of WI, scoring 59 at St. John, & 41 at Bridgetown. Later that year, in the series against the Zimbabwe, he scored 3 fifties, but his inability to convert fifties into hundreds, meant that he remained in the periphery of the team, not at the centre. The emergence of Inzamam-ul-Haq as a world class middle order bat, didn't help Mujtaba's cause. And, during the 1994-97 period he was in and out of the side, unable to become a permanent member of the side. His last test Match was against the Lankans in April 1997. At Sharjah, against SL, in 1993, he scored his career best 113 and shared 171 run partnership with Saeed Anwar. But his two most memorable efforts in ODI both came against Australia, in Australia. On 2 January 1987, at Perth, Australia batted first, and with Dean Jones smashing 121, the Aussies rattled 271/6(50 overs). Pakistan started briskly, but lost too many early wickets. When Mujtaba came to bat the Paks were struggling at 129/6, and the game looked over. Yet, Mujtaba changed the course of the match, with a brilliant 60* (of just 56 balls). Showing maturity beyond his years, he shared 3 partnerships, 53 with Manzoor Elahi (48), 53 more with WK Saleem Yousuf (31), and 43 with Wasim Akram, to take Pakistan to a 1 wicket victory. He was adjudged the Man of the Match. On 10 December 1992, at Hobart, Australia scored 228/7 from 50 overs. Pakistan top ordere batted too slowly and Mujtba, batting at no 6 felt the pressure. Fortunately, he found a willing partner in WK Rashid Latif. Together they put on 68 for the 7th wicket in double quick time. 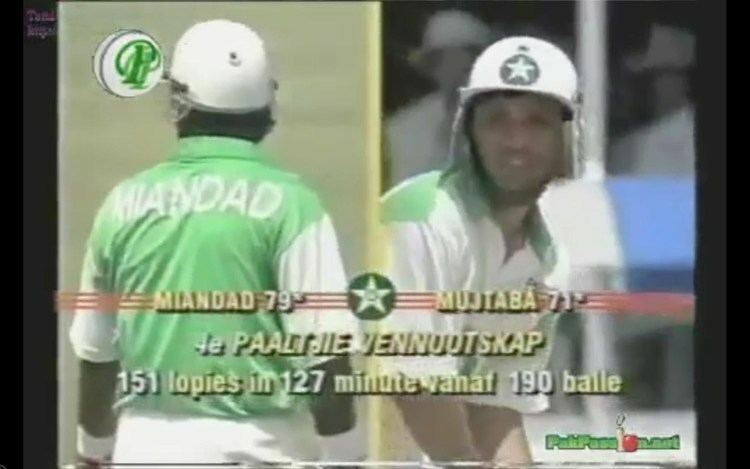 Still, the match seemed lost for the Paks, until Mujtaba hit the last ball of the match, a high full toss form Steve Waugh into the crowd to tie the match. His individual effort was 56*, and again he was the man of the match. He was a useful left arm spin bowler. His 4 wickets in Test matches came at a high average of 75.75. He is best remembered for taking the wicket of Alec Stewart just before tea on the 1st day of the Lord's Test match in 1992. Bowling his only over of the innings he had the England opener caught by Javed Miandad for a well made 74. Stewart's dismissal proved a turning point as Waqar Younis destroyed the England middle order after tea. His 7 wickets in ODIs have come at 94.00 a piece.